Bob Galen, an Agile Methodologist, Practitioner & Coach based in Cary, North Carolina, is offering Agile and Scrum training in the Boston area. In this role he helps guide companies and teams in their pragmatic adoption and organizational shift towards Scrum and other agile methodologies and practices. He is a Principal Agile Evangelist at Velocity Partners, a leading agile nearshore development partner. He is also President and Agile Trainer & Coach at RGCG. 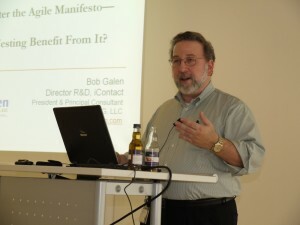 Bob regularly speaks at international conferences and professional groups on topics related to software development, project management, software testing and team leadership. He is a Certified Scrum Coach (CSC), Certified Scrum Product Owner (CSPO), and an active member of the Agile & Scrum Alliances. You’ve achieved a level of experience as a Scrum Master and you may have received a CSM or similar certification. But you’re beginning to realize that leading and facilitating agile teams is much harder in the real world. That creating an environment that empowers and fosters self-directed teams is a real challenge. And that inspiring teams to deliver on the promises (the results) of what agile can be is a moving target. This 1-day immersion workshop goes beyond the fundamentals to focus on the situational aspects of Agile coaching. We’ll explore real world scenarios and “mine” attendees for specific challenging situations. We’ll explore those scenarios and discuss your options for handling the most crucial and delicate of situations you’ll experience as your team moves through Agile & Scrum adoption. We’ll also tackle organizational adoption challenges and how to effectively lead your team in regulated, enterprise, and other more “challenging” environments. The course is primarily for Scrum Masters and Project Managers leading teams in existing agile organizations. It can also be a useful class for Agile Functional Managers & Directors, Product Owners, and Team Leads. Virtually anyone who is tasked with developing and leading an Agile / Scrum team, while struggling a bit to be an effective Servant Leader. You’ve just been selected by your boss for a Product Owner role, or you’re a newly minted Scrum Master trying to figure out how to play with your Product Owner, or you’re an experienced Product Owner who is struggling to balance between your stakeholders, customers and team, or you’ve just received your CSPO certification, but really don’t know how to be a REAL Product Owner. Join author and Product Owner coach Bob Galen in this fast paced, crash course in how to ROCK in your new role. In this workshop we’ll explore the dynamics of user stories, product backlogs, valuation and prioritization, establishing Minimal Marketable deliverables, and how to deliver high-impact sprint reviews. But then we’ll raise the bar to talk about product ownership at scale, how to build quality into your products, and how to effectively communicate and negotiate within your organization. You’ll leave the workshop with the ideas, skills, and techniques to become the Product Owner your boss envisioned you to be. The course is primarily for Product Owners, Business Analysts and Product Managers leading teams in existing agile organizations. It can also be a useful class for ScrumMasters and Team Leads. Virtually anyone who is tasked with developing a Product Backlog and driving their business vision with their Agile / Scrum team.